Okay, so you’ve picked up your Knitting Stitches Dictionary and you’ve mastered the basics: You can cast on, you can knit, and you can purl. You can even combine knit stitches and purl stitches in different ways and get really cool results. What now? Well, it’s time to practice some more. Do you want to try some color work? Some cabling? How about knitting on four needles? I have just the book you need: Learn to Knit by Sue Whiting. 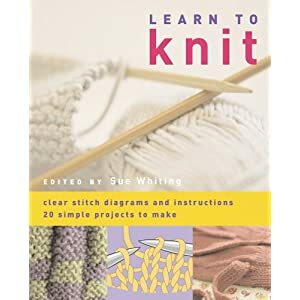 This is a great book for the Intermediate or Advanced knitter. The introduction is full of reminders of the basics, from fixing common mistakes to shaping and finishing your work. The book has clear diagrams and photographs throughout, including 20 “simple” projects. Just a note: the first project, a pot holder rated at one star (least difficult) is worked in three colors with slip stitching. Other projects include sweaters, gloves, and even a pair of boot socks. 2. Follow @landlockedsailr (note spelling) on Twitter–you can use the Twitter button on the right, too. The next step is very important: Comment on this blog post and tell me how you entered. Each person can enter up to three times, once per method (subscribe, follow, or fan). Also leave contact info (Your Twitter @name at least) so I can notify you if you win! One winner will be chosen at random on Sunday, 4 April 2010. Winner will be announced via Twitter and http://www.thelandlockedsailor.com on Monday, the 5th. If prize is not claimed within 48 hours, another name will be drawn. Happy knitting! Pretty Book. I haven’t seen that one. It looks like one I’ll recomend to my friend when I teach her to knit this weekend. I’ve been knitting for a while and really have begun to find it difficult to find patterns that interest me. I’m excited to see what all you have in this book. I just subscribed as a reader on blogger. Please enter me in the contest. Thanks! I haven’t seen this book yet but it looks interesting 🙂 I haven’t done MUCH color work… the extent is the Dr. Who scarf I’m working on for the boyfriend. And I’ve now also become a fan on FB. Very happy to have stumbled across your site. Noticed your contest on my Facebook page and became a fan that way! Love all things knitted! Looking forward to viewing this book and hopefully finding new, interesting patterns. I entered via facebook and twitter. Hi there, I have entered via FB,Twitter and by subscribing to the feed to my Yahoo address. I found you on FB…I am an avid knitter and am always looking to learn new stitches…Thanks for being here. I entered as a blog reader. I am fairly new to Knitting but would love to have this book. Thanks! I subscribed to your blog via e-mail and facebook. Thanks. I follow you on Twitter (@yarnpanda), I’m a fan on FB (Alice McElwee) and I subscribe via Google Reader! Your Free knitting book giveaway caought my eye on Twitter..you can never have too many knitting books ( : I subscribed to your blog Via MyYahoo! and am on Twitter as @gemsofmyheart…love your blog! became a fan on Facebook!! I subscribed using methods 1 and 3! have never been able to master continental. i know i would knit faster if i could learn it but it just doesn’t stick. I haven’t been able to either! It’s one of my goals though. Thanks for the give a way! I just joined as a fan on facebook.com. Please enter me in the drawing. I subscribed via email. Thanks so much for the great giveaway!